Before we get to the interview, I have a confession to make…I suffer from too-many-ideas-too-little-time-itis. It’s plagued me for a while now and has resulted in a few purchased web domains, email conversation and pitch decks with friends that fall off the radar, even downing multiple $14 cocktails while discussing video and e-commerce and mobile possibilities. This disease is not going away so feel free to call me out on starting an idea and then letting it float away. We’ll eventually get better at seeing ideas through like posting Facebook polls to learn your thoughts on the best parts of our blog. Early on when we started writing this blog, I had one of these ideas. I thought it would be really friggin cool to reach out and interview wine professionals, initially asking the basic questions and eventually moving up to the “you can’t handle the truth” type. Ask sommeliers about their cellar, the timeline to ship, training their staff of making suggestions. Ask winemakers about supply and demand, growing conditions, disease prevention. Ask wine retailers about their sourcing, competitive differentiation, the power of WS ratings (maybe even try and do a wine shop apprenticeship – free labor for free education – I may still try that). Like most ideas, this one sat in the background of our planned writing. We filled our calendar with tastings, picks, and visits to vineyards, but a funny thing happened on the way to our April tasting. We sniffed and swirled the Chateau Ballan-Larquette Blanc and found a fun comment on our site waiting for our review; it was from the winemaker of Ch Ballan-Larquette – Regis Chaigne. First reaction – could this be true? Our first comment/email was from an Argentinian company offering a link exchange with HornyMatchesReviews.com (Disclaimer – I haven’t visited the site and recommend caution if you decide to roll the dice). Second reaction – Jackpot! An opportunity to talk to a wine professional fell into my lap. It could not be a clearer sign unless a sommelier fell from the sky, so I emailed back and suggested an interview (the first interview) and Regis gladly accepted. No joke. We talked for 90 minutes over Skype about a ton of stuff. It was an immensely rewarding conversation, and I hope I shared some interesting perspective with Regis. We discovered a little bit more about Regis’ background as a winemaker, his relationship with BevMo and Wilfred Wong (and how his wine makes it’s way to America), and his goals with crafting his Bordeaux wine to American tastes. Regis got into the wine business through his family, but like many kids, he opted to try out some other careers before joining the family business. His dream was to become a pilot, but his eyesight redirected his path towards engineering. Call me crazy, but I don’t think there are many 10 year experienced electrical engineers making wine these days. It wasn’t until Regis was approaching 30 that he considered becoming a winemaker. Regis’ family owned and cultivated a plot of Bordeaux varietals for generations. His parents replanted 15 hectares in the 1970s. The vineyard is located in the heart of Entre Deux Mers. In the early 1990s, Regis’ parents decided it was time to retire and sell their vineyard. Regis took this opportunity to switch things up and spend a year studying viticulture & oenology in Bordeaux. The program also taught him about the legal process of owning an estate and common commercial issues. It also provided him with a network of friends in the business that further accelerated his ability to succeed after taking over from his parents. The Chaigne family started with 15 hectares of vineyards in 1990 and has now grown to 42 hectares. 180% growth is a nice accomplishment to put on a resume. Besides growing his operation, Regis is very focused on helping change the image of Bordeaux. He’s right in his assessment that the American consumer thinks of Bordeaux as complicated, expensive, and old-fashioned. Instead of playing to that image, Regis is trying to get the American consumer to realize that Bordeaux can be enjoyed every day through efforts like Planet Bordeaux. You can also check them out on twitter. We also talked a little bit about his relationship with Bevmo. As you may know, the US established a 3 tier system (producers – distributors – retailers) after Prohibition. This means Regis does not sell directly to Bevmo. Regardless, he’s worked with Bevmo (and Wilfred Wong) since 2005 and his 2003 vintage. He’s shipped wine by sea, truck, and air in their history together, which made me really think about the logistics involved with customs, fuel, etc. Towards the end of our conversation, we started talking about making wine for the American consumer. Again, Regis is trying to enhance the image of Bordeaux wines as approachable options for everyday. Beyond the marketing messages, Regis also takes specific steps to tailor his end product to suit our tastes, BUT (and it’s an important but) he doesn’t go too far and lose the sense of place with his wine. It’s a delicate balance between staying true to tradition and Bordeaux versus crafting wine for a typical consumer. Bordeaux red varietals starts out as a challenge since their tannins are rough and require time to polish them into smooth elegant wines. True, terroir (drink! 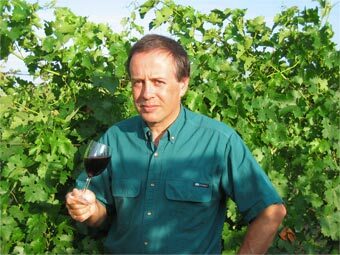 – see last paragraph) is important, but there are other steps a winemaker can use to tailor a wine. From harvest time to fermentation temperatures to oxygenation, there are a number of ways to adjust the character of a wine to be younger and fruiter. 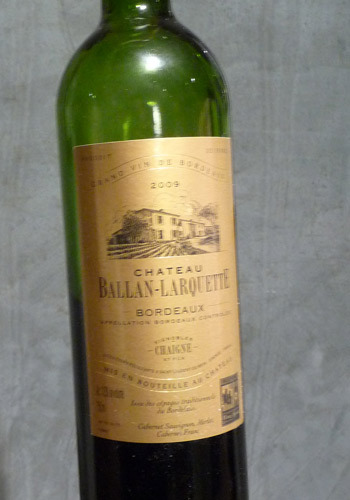 In honor of this first interview, we decided to combine it with another tasting of Chateau Ballan-Larquette. We tried the white in April, so we decided to give the 2009 red a try. On the first smell, I noticed a subdued fruit scent that was hardly overpowering. Which each successive sniff, I picked up some more nuance like spice, earth, and crushed rocks (what can I say, I was an curious kid). All in all, pretty interesting. The taste was similar, and I could tell what Regis meant by polished tannins. The fruit was subdued and produces a pleasant lasting taste without any sticky tannins. I put my price down at $14. Bevmo has it on sale for $12.99 so it looks like CBL is a safe bet for me. Unfortunately, Linda didn’t share my opinion and thought it would be better below $10. Either way, we learned a ton from Regis Chaigne, and are very thankful that he offered to be our first interviewee. Be on the look out for more to come. If you have any good questions for us, leave a comment.